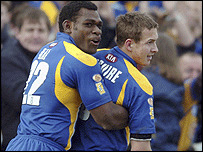 Five players from table toppers Leeds Rhinos have made the 2004 Super League Dream Team. Third-placed Hull FC supply three players to the team while Wakefield have two representatives. Eight players are qualified for Great Britain while there are three former New Zealand internationals and one Papua New Guinea international. Both Bradford (Lesley Vainikolo) and St Helens (Paul Sculthorpe) have only one representative in the 13. St Helens coach Ian Millward hit out at the selection after only one of his players made the line-up. "If it's based on all the year, how come Sean Long is not in it because after 18 or 19 rounds he was the best half-back in Super League by a mile?" said Millward. "Jason Hooper has also been fantastic. How does Ali Lauitiiti get in when he's only played the back end of the season? I find it really warped." S Briscoe (Hull); L Vainikolo (Bradford), K Senior (Leeds), S Domic (Wakefield), M Bai (Leeds); D McGuire (Leeds), R Horne (Hull); A Farrell (Wigan), M Diskin (Leeds), P King (Hull), A Lauitiiti (Leeds), D Solomona (Wakefield), P Sculthorpe (St Helens).